Carpets are important in terms of appearance and they can also impact on our health. Carpeting, whether in a home or an office environment, collects and absorbs airborne pollutants such as dust mites, pollen and allergens in addition to the usual types of dust, soil, bacteria and dirt that get tracked in on shoes and feet. Many of these substances are released back into the air creating an unhealthy indoor environment. In order to ensure that your carpets look good and healthy, you should follow a routine of regular vacuuming and professional carpet cleaning. With regular care and maintenance the life of your carpets will also be prolonged. While carpet cleaning is quite often part of a deep clean or spring clean service, here at Tower Hamlets Cleaners we offer carpet cleaning as a separate service. Some of our customers choose to combine carpet cleaning with upholstery cleaning which is a sensible and practical option as many of the cleaning materials and equipment that is used is the same for both. Our rug cleaners are familiar with various types of fabrics and carpet materials. This means that they utilise cleaning products and equipment that will not harm or degrade the carpets and will clean them deeply and gently, loosening and removing dirt in the fibres. In order to minimise disruption to your home or office, we offer fast drying and dry rug cleaning processes in addition to the standard methods. We will your leave carpets clean, free of any residue, dry and fresh-smelling. We also offer various cleaning services aside from our carpet cleaning. 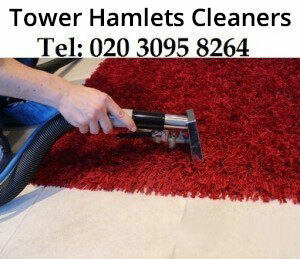 Call our cleaning company Tower Hamlets now on 020 3322 7907. You could also ask us about our cleaning prices.